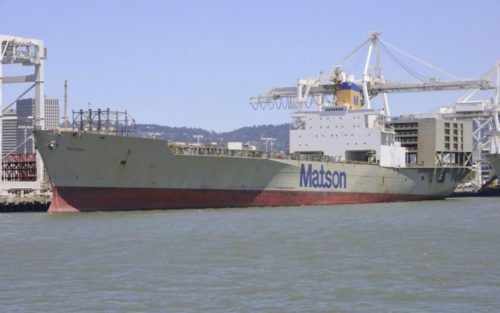 SAN FRANCISCO–The Coast Guard continues to respond Friday to a sheen reported from a container ship moored at the Matson Terminal in Oakland. Crewmembers aboard the Matsonia, a 713-foot U.S.-flagged container ship, noticed a sheen around their ship around 8 a.m. Thursday shortly after mooring, which was believed to have originated from the vessel. The Matsonia crew initiated the ship’s vessel response plan, notified the Coast Guard and the National Response Center of the sheen and placed containment boom around the ship to contain the sheen. Divers contracted to investigate the sheen discovered a fracture in the hull of the ship approximately 15-feet below the waterline adjacent to the starboard fuel tank. Coast Guard marine inspectors and pollution responders arrived on scene around 10 a.m. Thursday to conduct an assessment of the ship and ensure appropriate pollution containment measures were in place. Matsonia crewmembers completed internal transfer of the heavy fuel oil to other fuel tanks throughout the ship Friday to mitigate the potential for more fuel to enter the water. Once the fuel tank has been deemed safe to enter, Coast Guard marine inspectors are scheduled to inspect the vessel and oversee repairs. A barge is expected to arrive Friday around midnight to offload fuel from the Matsonia.